Aaron Kelderhouse serves as the B2C Enterprises Creative Director and lead Graphic Designer. His focus is to help our team interpret our clients' needs and visions into campaigns that creatively communicate a message while maintaining their brand. 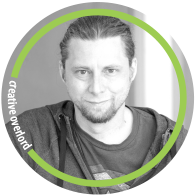 To accomplish that, he oversees and collaborates with a diverse and talented group of other creatives both on-staff and freelance. Aaron grew up in the Roanoke Valley and has a lifelong background in fine arts and illustration. On top of his artistic foundation, he has continually expanded his experience with the technical skills used in the advertising world. His early work history includes pre- and post-press work as well as sign design, production and installation. Later in his career, his time as lead Graphic Designer and Production Editor of a local newspaper gave him a great respect for working efficiently with challenging deadlines. The combination of design skills and attention to work flow made him a great early addition to the company. During his time at B2C Enterprises, Aaron has also grown to appreciate the value of a healthy and cooperative work environment. In our high-paced world, he uses his position as the “hub” of most of B2C’s projects to encourage and motivate all members of the team to look out for one another. It’s his belief that the best way we can take care of our clients is to take care of ourselves.